Translation from Interface - Comunicação, Saúde, Educação, Botucatu, v.14, n.35, p. 891-904, Dez. 2010. Philosopher of science Ian Hacking writes that our world is one of classifications, and these classifications, or names, have a particular effect when they refer to the behavior of people. This article seeks to present what ADHD is and how it appears in children. It then discusses the conversion of undesirable behaviors into symptoms, which underlies the identification of ADHD as a disease. From these considerations, a more general model about the interaction between classifications and classified people is proposed, based on Hacking's distinction between indifferent and interactive kinds, and also on the concept of the looping effect proposed by that author. Finally, the model is applied to ADHD, and some remarks are made regarding the concepts of social control put forward by Peter Conrad. Keywords: Ian Hacking, ADHD, looping effect, classifying people, medicalization of childhood. Palavras-chave: Ian Hacking, TDAH, efeito de arco, classificação de pessoas, medicalização da infância. Palabras llave: Ian Hacking, TDAH, efecto de arco, clasificación de las personas, la medicalización de la infancia. The world of Western man is highly systematized. Phenomena, objects, animals and people are analyzed, deconstructed and reduced to general concepts. The classification of entities with which human beings are incapable of communicating does not generate any interaction, but unexpected phenomena may arise when the targets of the classifications are also people. All classifications of people generate responses. Some ethnic or social groups (sometimes determined arbitrarily) end up becoming targets of prejudice, and even people who are considered ordinary or normal receive different labels. However, there are institutional or "official" classifications that are disseminated more readily and which have greater credibility in the eyes of society. The diagnosis of attention-deficit hyperactivity disorder (ADHD) can be considered to be an official classification, and if children with ADHD are classified as mentally ill, this has major implications. The aim in this study was firstly to present, along general lines, the way in which Ian Hacking described the interactions between classification and classified, and then from this point, to propose a more general model relating to this interaction, based on the distinction between indifferent kinds and interactive kinds, and also on Hacking's notion of the looping effect, in section 2 of the present paper. Section 3 presents ADHD, how it arises, its diagnostic criteria and the possible causes attributed to this classification. Following this, section 4 provides a discussion on conversion of undesirable behavior into symptoms, which lies behind identifying ADHD as a disease. Lastly, Hacking's proposed model is applied to ADHD in section 5, which also includes remarks on Peter Conrad's notions of social control. The philosopher of science Ian Hacking (2006) wrote that our world is a world of classifications and that these classifications or names have particular effects when they refer to people's behavior. As detailed in this section, individuals may be aware of their classification and, through this, they may modify their behavior. In order to understand the way in which a name or a diagnosis may influence individuals' behavior, and especially children's behavior, the distinction between Hacking's indifferent and interactive kinds needs to be delved into. According to a realistic conceptual view of science, the world is composed of kinds of entities, and the task of science is to create and refine classifications, so as to have increasingly faithful portrayals of the "true" types that constitute the world. One example of refinement of classifications occurred in the history of biology when, after many centuries of being considered to be fish, whales were then classified by Linnaeus as mammals. In the words of Richard Boyd, one of the advocates of this position, the task of science is to accomplish an "accommodation of language to the causal structure of the world" (Boyd, 1986, p. 358; italics in the original). Over the course of scientific work, an image of the world as it is would gradually be built up, by cutting up nature "along its true joints". This definitive representation of the world, which science would approach asymptotically, would be formed by natural kinds corresponding to the entities that really exist. The philosophical discussion on natural kinds began in the middle of the nineteenth century and is still surrounded by controversy. For example, the extent to which the terms for natural kinds within ordinary language (such as "southern right whale") correspond to the scientific terms (such as "Eubalaena australis", the scientific name for the southern right whale) can be questioned. It may happen that the name of an animal in ordinary language corresponds to more than one biological species, or the same species may receive two names in ordinary language (if, for example, the male and female are very different from each other). Biological species are not the only natural kinds. The most classical examples are geometrical shapes (triangle, pentagon, etc. ), chemical species (gold, water, etc.) and geological species (bauxite, pyrite, etc.). Recent philosophical analyses (Hacking, 1991) have tended to recognize that these objects are very different from each other, to the point that there is no such thing as a single concept of natural kind. What can be said, for example, about diseases? Can conditions like syphilis, dengue and depression be considered natural kinds? To discuss this point, Hacking (1999) introduced the distinction between indifferent kinds and interactive kinds. According to Hacking, the "classical" natural kinds (geometrical shapes and chemical, biological and geological species) are indifferent, in that they do not interact with the classification that they receive. For whales, nothing changes when they were classified as mammals instead of as fish. On the other hand, human kinds or kinds of people react to classifications that are imposed on them and, as argued by Hacking (2006), do this whether or not they are aware of such classifications2. Individuals whose classification changes from "pretty" to "ugly" drastically change their behavior. However, Hacking seems to consider that the impetus of classifying individuals (which is deeply rooted in many different cultures) to be a continuation or variant of the attitude of classifying indifferent kinds. In a review of the philosophical literature on natural kinds (Hacking, 1991), while rejecting Richard Boyd's idea that there is only one true way to classify nature, Hacking drew attention to the pragmatic role that classifications have had in the history of civilizations. These dispositions of natural kinds (i.e. what they are capable of doing or what can be done with them) have aroused and maintain human interest in them. For example, it has been important to have good criteria for identifying copper among other metals because of its usefulness for civilization (to serve as an electricity conductor, etc.). Dispositions may also be important factors in refining classifications: it suffices to mention the implementation of procedures enabling differentiation between gold and pyrite (fool's gold). When the reasoning detailed in the preceding section is extended to kinds of people, institutions become necessary (Hacking, 2006; 2007) in order to determine what dispositions are important for classification3. It can be conjectured that at the outset of early civilizations, the human dispositions of greatest prominence were the capacities to work and procreate. A sick individual meant that there was one less in the contingent of the fit and fertile. From this arose the need to bring in procedures that would restitute the lost dispositions. Furthermore, diseases also have dispositions: to cite some examples, rabies is a fatal disease, stroke leaves psychomotor sequelae, leprosy causes losses of sensitivity at the extremities, and so on. In other words, the dispositions of diseases are their symptoms or the consequences from them. For this reason, as in the case of natural kinds, the dispositions of diseases make it possible to refine their own classification and consequently the diagnosis. The diagnosis is the central point of the divergence between natural kinds and human kinds, and it is where the bifurcation between indifference and interaction occurs. From the practical point of view mentioned above, making a diagnosis signifies labeling or imposing a mark, in the same way that a suspicious nugget may be marked for inspection or cattle may be marked for slaughter. In this sense, the diagnosis represents an entry ticket into standardized and, especially, institutionalized procedures. However, whereas the behavior of the nugget does not change, regardless of whether it is classified as gold or pyrite (even though the subsequent procedure differs between the two cases), the behavior of individuals certainly changes in the light of a diagnosis of cancer. Hence, the disease itself may be an indifferent kind, insofar as it does not react according to whether it is classified as (for example) measles or chickenpox. This question is crucial, and it is connected with what will be referred to henceforth as the biological causes of the disease4. Here, diseases are taken to be complex phenomena with many causes, and each of these can be studied at a relatively autonomous level of analysis. Biological causes correspond to the set of causes commonly called etiology. They are the avatar of the disease at the level of biomedical analysis. For diseases to have biological causes, there has to be an unambiguous correspondence between the causes and the set of symptoms, and a set of symptoms cannot have more than one set of biological causes. Thus, from the biomedical perspective, diseases are sets of symptoms unambiguously caused by a set of biological causes. So far, with the possible exception of depression, the diseases that have been mentioned present relatively clear biological bases. In the cases of syphilis, dengue, measles and chickenpox, the biological causes are even embodied in the form of etiological agents, or more properly, in the relationship between these agents and their hosts. In the case of cancer, the biological causes are located in the patient's own organism (genetic defects relating to cell division, although "genetic" does not necessarily mean "hereditary" here). Depression is an example in which a set of symptoms may have more than one set of biological causes, or there may even not be a set of biological causes. In this case, depression would not be a disease in the strictly biomedical sense defined above. Hacking (1999) also suggested that some kinds (certain diseases like schizophrenia and autism) are at the same time both indifferent and interactive. The indifferent component of the disease is its biological causes, while the interactive component is the stereotype of the individual with the disease, which from the biomedical perspective refers to the set of symptoms. However, the stereotype of the individual with the disease also takes on a social characteristic, when embodied in the patient's own behavior. Thus, there are three elements from which the interaction between classification and classified are constructed: from the biomedical side, the biological causes and the set of symptoms, and from the social or extra-biomedical side, the patient's behavior. The transformation of behavior that is taken to be undesirable, into symptoms of diseases, is one of the main ways in which looping effects are generated. In the following, a simple model aimed at describing how this transformation takes place is put forward, and the reason why this process is subject to the looping effect is shown. An important clarification can be made regarding the looping effect, taking the three elements cited earlier into consideration (biological causes, set of symptoms and patient behavior), along with the role that each of these has in identifying a disease. Firstly, a scenario in which there is no looping effect is considered (Figure 1). In stage 1, a diffuse set of symptoms is perceived in a group of patients. Next, biological causes that explain a portion of the initial set of symptoms are postulated. The transition from stage 1 to stage 2 can be called biologization. Lastly, only the portion of the set of symptoms for which a biological basis can be ascribed is used to make the diagnosis. The transition from stage 2 to stage 3 can be called reduction. In this scenario, the looping effect is ignored. Identifying a disease, which may be the result from years of research, ultimately isolates a set of symptoms that are relevant in making the diagnosis (stage 3). Laboratory and other tests for this disease are used to link the symptoms. This scenario is not intended to be exhaustive: after stage 3, the healthcare team's work evidently continues. A patient who presents a set of symptoms that roughly corresponds to the set in stage 3 is marked (in the sense discussed earlier) for tests to be performed in order to identify the presence of biological causes that are commonly associated with that set of symptoms. If the clinician concludes that the results confirm the presence of these causes, the diagnosis is made and the patient is again marked, this time for the treatment process. Cases in which there is a loping effect are now considered (Figure 2). It should be noted that here, the "symptoms" are purely behavioral, and any biological bases found for sustaining them are always doubtful. The looping effect occurs in passing from stage 3 to stage 1, when a diagnosis causes a patient to change his behavior and thus, change the set of "symptoms" for that condition. Hacking (1999; 2007) stated that in this case, the people thus classified are "moving targets", i.e. in changing their behavior, they even end up changing the stereotype of the classification. Hence, they are not stable subjects of knowledge. Jonathan Tsou (2007) criticized this point, through claiming that no matter how much an individual changes his behavior, he will be incapable of changing the biological causes of his condition. Tsou made particular reference to the biological causes of schizophrenia (excess of dopaminergic activity in the mesolimbic pathway): no matter how much a schizophrenic patient changes his behavior, he will be unable to diminish the dopamine concentration in his brain. It is possible that Tsou considered that this type of looping effect was as absurd as the idea that a cancer patient would be capable of removing the tumor just by "force of thought" or at least by behaving as if he had removed the tumor. However, the hypothesis that certain sets of symptoms described in the literature do not have unambiguous biological causes and thus do not constitute diseases in the biomedical sense needs to be taken into consideration. Tsou himself recognized that this was perhaps the case in a large proportion of the disorders listed in the DSM-IV (Tsou, 2007, p. 339n). It is very likely that ADHD fits into this group (Timimi, 2002, p. 88). In order to think about the significance of ADHD for children, it first of all needs to be understood what the disorder is, what criteria are used for diagnosing it and how its historical evolution has taken place. In some academic circles, ADHD is considered to be the commonest psychiatric diagnosis during childhood. It is characterized by three main symptoms: lack of attention, impulsiveness and hyperactivity (Vasconcelos, Junior, Malheiros et al., 2003). 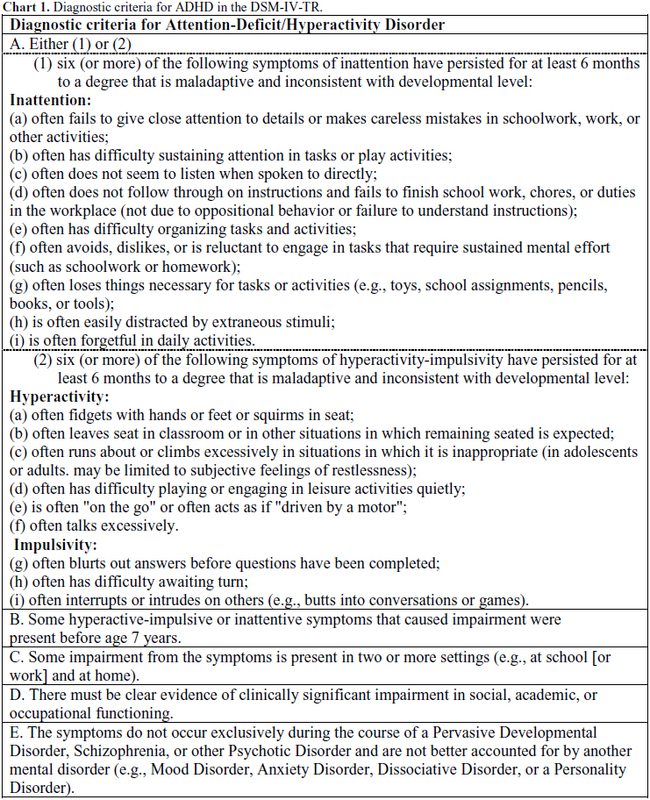 Chart 1 lists the DSM-IV criteria for diagnosing ADHD (DSM-IV-TR, 2002). ADHD was known by several names over the course of the twentieth century. Among these were "lethargic encephalitis", "minimal cerebral damage", "minimal cerebral dysfunction", "hyperkinesia", "attention deficit disease" (ADD) and "attention-deficit hyperactivity disorder". For each of these disease categories, sets of similar symptoms depicting deficits during childhood have been described. The following are some of the most cited symptoms, which are common to all these names: low performance at school, extreme extroversion, violent behavior, incapacity to complete tasks, thievery, disturbed sleep patterns, morality inconsistent with the age and forgetfulness (Rafalovich, 2001). The idea that agitation, low concentration and impulsiveness among children are medical phenomena is recent. Interest in children who presented low attention capacity and hyperactivity began at the start of the twentieth century when a pediatrician, Frederick Still, described a group of children who had an abnormal incapacity to maintain concentration, together with restlessness and irritability (Still, 2006 ). The characteristics of hyperactivity and lack of attention among children were only correlated with each other with the emergence of the diagnosis of minimal cerebral damage, after the epidemics of encephalitis during the first decades of the twentieth century (Timimi, 2002). During the 1930s, the action of psychostimulants for reducing restlessness, hyperactivity and behavioral problems among children was discovered. In the 1940s, Strauss suggested that hyperactivity in the absence of histories of abnormalities in the family could be considered to be sufficient evidence for a diagnosis of cerebral damage (Timimi, 2002). However, as the years went by, no organic lesions were found in these agitated children. Thus, from 1960 onwards, the term "minimal cerebral damage" fell into disuse. On the other hand, even though this hypothesis was abandoned, there was increasing interest in syndromes that were defined behaviorally. Researchers started to believe that this syndrome was caused by some type of cerebral dysfunction. In the second edition of the DSM, the disease was called "hyperkinetic reaction of childhood" (Timimi, 2002). The third edition of the DSM was published in the 1980s, and the name became "attention deficit disorder" (ADD). The problem could be diagnosed with or without hyperactivity symptoms and was defined using three lists of symptoms: one for attention deficit, one for impulsiveness and one for hyperactivity. In the fourth edition of the DSM (DSM-IV), the criteria for the diagnosis changed again, this time towards a two-dimensional model: attention deficit in one subcategory and hyperactivity and impulsiveness in the other. It is important to highlight that, in each revision, the number of children with characteristics of the disease increased. The change from DSM-III to DSM-IV increased the prevalence of the disorder by around two thirds (Timimi, 2002). The prevalence of ADHD has been investigated in many countries, and studies using the criteria of the DSM-IV have tended to find prevalences of 3-6% among children of school age in the United States. In Brazil, the prevalence rate in studies of this type has been found to be 3.6 to 5% of the school-age population (Andrade and Scheuer, 2004). The proportions of the disorder between boys and girls, according to epidemiological studies, has ranged from 2:1 in population based studies to 9:1 in clinical studies, respectively (Rohde and Halpern, 2004). Despite the large number of studies that have already been conducted, the causes of ADHD remain unknown. The best-accepted idea among researchers working on this topic is that there are genetic and environmental factors that influence the development of the disease. In relation to genetics, there are hypotheses that correlate several genes of minor effect with vulnerability to the disorder, which may or may not develop, according to the environmental conditions. According to recent studies, the appearance of ADHD is also related to abnormalities in one or more neurotransmitters, such as catecholamines, particularly dopamine and noradrenaline. However, data on the relationship between ADHD and neurotransmitters are still very scarce (Rohde; Halpern, 2004). In relation to diet, some studies have suggested that certain preservatives like sodium benzoate and artificial food colorants may exacerbate hyperactive behavior among small children (Barrett, 2007). Another nutritional factor relating to this disorder is low serum ferritin levels, which indicate iron deficiency. According to studies on this subject, iron modulates dopamine and noradrenaline production: the quantities of these substances in individuals with ADHD are unbalanced (Konofal, Lecendreux, Deron et al., 2008). However, it is important to emphasize that in speaking of neuron and neurotransmitter development from the point of view of neuroevolution, a certain level of hyperactivity in children up to the age of around four to five years is acceptable, given that the prefrontal region (the location for the behavioral "motor brake" in humans) only becomes completely developed at this age (Rohde and Halpern, 2004). The treatment generally indicated by healthcare professionals encompasses psychosocial and/or psychopharmacological interventions. For psychosocial interventions, an educational approach is recommended, providing clear and precise information to the family regarding the disorder. Furthermore, school support is advisable, through implementing a consistent daily routine, physical activity and individualized attention, whenever possible (Zavaschi and Rohde; Lorenzon et al., 2004). In relation to pharmacological treatment, stimulants are considered by most professionals and researchers to be the first-choice medications. In Brazil, the only stimulant approved and available on the market is methylphenidate, under the commercial names RitalinaÂ® (Novartis) and ConcertaÂ® (Janssen-Cilag). In cases of comorbidities, intolerance or lack of response to stimulants, tricyclic antidepressants are often used, for example imipramine (Zavaschi, Rohde, Lorenzon et al., 2004), under the commercial name TofranilÂ® (Novartis). It can be seen that ADHD is a recent phenomenon and that, prior to the twentieth century, characteristics that today are considered to be symptoms, such as restlessness, impulsiveness and hyperactivity, were regarded as normal behavior. Thus, it can also be seen that today, scientific knowledge and healthcare practices have made the threshold between health and disease, i.e. between normal and pathological, very tenuous. Individuals merely have to present behavior that society in general deems undesirable for them to be labeled as "depressive", "anxious", "crazy" or even "hyperactive". This comes about because the natural highs and lows of life and the correlated behavioral patterns that were previously considered to be normal have been converted into pathological states (Blech, 2005). According to Georges Canguilhem (1982), science describes normal human beings as those that fit within preestablished standards that are determined through averages. However, he posed a question: should deviations be considered to be abnormal? The models for normal individuals are produced from statistics, but in Canguilhem's view, real individuals diverge from this model and this is what makes them different from each other. With regard to children, the learning targets established for each age group at school show the great influence of the positions taken. Most children learn to read at a certain age; those that do not start to read together with the others can easily be regarded as deviant. The characteristics of ADHD are generally perceived at school, and children are referred to healthcare professionals from there. The words of a teacher about a "problem student" taken from the book by Cecília Collares and Maria Aparecida Moyses (1996) illustrate this point: "she's way behind. I think that she should be referred to the health services or a psychologist, because she has something; she's way behind. From her size and age, I think she should have learned by now. She's still at the pre-syllabic stage." (p. 250). One necessary condition for individuals to have a social life is that everyone should share the same, previously established standards. When a rule is broken, such as not learning to read within the "normal period", restorative measures are taken: "success or failure in maintaining these standards has a very direct effect on individuals' psychological integrity" (Goffman, 1988, p. 138). The above citation is no more than a repertoire of reductionist explanations for learning problems. According to Richard Lewontin (Lewontin, Rose and Kamin, 2003), reductionists are people who try to explain the properties of complex systems (such as learning) by focusing on just a few aspects. From a reductionist perspective, the problem of non-learning lies in isolated characteristics such as skin color, socioeconomic level, place of origin and presence of diseases. Disease has been used as an explanatory factor for individuals' deviations within society, a phenomenon that can be called biologization. Thus, properties are reified, i.e. they gain localization and are treated medically. That is, they are seen as caused by events in individuals' brains that are associated with modifications in the quantities of certain chemical substances (Lewontin, Rose and Kamin, 2003). This process of biologization, especially of conflicting social issues, generally takes place at times of great social tension. For example, this occurred during the 1960s, when science "proved" that white men were genetically superior to black men, in intellectual terms; and that women and men presented intellectual differences because of neurological differences that were also genetically determined (Collares and Moysés, 1996). Biologization of non-learning is very common within the school environment, and it causes responsibility for academic failure and dropping out of school to fall on illnesses. In biologizing social issues, the entire social system becomes exempted from responsibility. At school, the lines of a political-pedagogical discussion are shifted to medical causes and solutions, which are inaccessible to education (Collares and Moysés, 1996). Thus, according to some teachers, doctors and parents, as well as the children themselves, very active individuals, who do not pay attention as they should, present some type of health problem (Conrad and Schneider, 1992). Dealing with this undesirable behavior as a medical problem was, and continues to be, well accepted within society, and there are various reasons for this. For doctors, the therapy is relatively simple (prescription of a medication) and the results may be excellent, from a clinical point of view. In turn, the diagnosis of ADHD indicates that this is a disease that can be treated, which diminishes the extent to which parents can be blamed, and means that parents may regard the diagnosis favorably. In addition, the medication frequently makes the child less agitated and hyperactive in the classroom and often facilitates learning, thereby also resolving the problem at school (Conrad and Schneider, 1992). Hacking (2007) writes that behind every classification, there is a structure that encompasses five primary factors: the classification, individuals, institutions, knowledge and specialists. The classification in itself generates the kinds of people. Children with ADHD are one kind of person, formed by individuals who share the same problem. This group of people has a name and their characteristics are determined as a function of this name. Individuals (or their families in the cases of ADHD) often only start to see certain characteristics of the classification as problems after receiving the diagnosis. Institutions confirm the existence of this classification and are a means of legitimizing that kind of person. One example of an institution in this case is the DSM-IV, which provides a means of legitimizing and justifying the diagnosis of mental disorders. The DSM-IV presents a series of behavioral characteristics, as can be seen in item 3, which indicate whether the child presents ADHD. These criteria are interpreted by specialists, through descriptions from the child's family and educators. Thus, knowledge and specialists have the power to decide who is ill and who is not; and who presents ADHD and who is normal. The diagnosis for the disorder is essentially clinical; there are no laboratory tests or imaging examinations that can aid in this decision. Specialists only have their technical knowledge, the criteria of the DSM-IV and information coming from people with links to the child available for outlining the diagnosis and indicating the appropriate therapy for the case. After the diagnosis has been made and, generally, after medication has been prescribed, these children go back home and back to school labeled with a psychiatric disorder. In section 2.2, it was mentioned that the classifications interact with the individuals classified, and that this interaction takes place through the looping effect. The tendency is to think that this looping effect only occurs in relation to people who are aware of the label that has been given to them, i.e. people who understand the significance of their disease. What about individuals who are unaware of the classification, such as people who cannot understand the language, babies or small children (Hacking, 2006)? Children are often diagnosed with ADHD before they are able to understand its significance. In such cases, it can be said that the feedback effect is impossible. However, Hacking (2006) stated that the looping effect involves much broader units, such as the family, and in the specific case of ADHD, it may also involve the school. It is impossible to believe that this label will not have an influence in many decisions that the family, and subsequently the adult diagnosed with ADHD during childhood, will make. From a well-established diagnosis, any unexpected behavior by the child comes justified by the disease that is presented. The attitudes of people around this child become modified because of the diagnosis and the characteristics that are taken to due to the disease. This change affects children with ADHD and makes them see themselves differently, thus giving rise to the looping effect. As mentioned in item 2.2, the looping effect may present two different effects, which Hacking called positive and negative feedback effects (Hacking, 2006). Thus, it might be suggested that most children with ADHD end up presenting a positive feedback, in response to their way of experiencing the condition and how their families and schools start to deal with them after the diagnosis has been made. These types of behavior reinforce the characteristics of the disease and may lead to a perception by the child that he is ill and may lead to acting as such. From the moment when someone enters the list of ill people, a treatment for this condition needs to be available. In general, it is believed that children with ADHD should receive medication in order to correct their deviant behavior, so that they can continue to live within society and enter within its standards and rules again. Peter Conrad (Conrad and Schneider, 1992) called this control over deviation and promotion of social conformity social control. Individuals who strayed from the standards would have to be controlled, so that society, or the family or the school could return to its "normal state". Conrad maintained that there were formal and informal levels of social control. Informal control would include both self-control (internalization of standards, beliefs, morals and so-called "conscience") and relational control (day-to-day relationships), and would inhibit individual behavior that was considered to be deviant. For example, somebody could go out from their home with a desire to pick a fight with the first person that he might meet on his way; however, he would not do so, both because of his moral beliefs and conscience and because of what other people would think and say about such an act. Formal social control encompasses institutional forms of control, such as the legal, police, educational and social care systems and even the healthcare system. These are the "official" forms of control: the ones that nobody is capable of questioning unless he is a specialist in this field. Because these are so well accepted and, in the case of healthcare, because it is backed by science, their consequences are generally much more profound and long-lasting, both for individuals and for society and the environment in which these individuals live (Conrad and Schneider, 1992). Thus, receiving a diagnosis of ADHD from an official institution leads to a change in behavior, not only among the individuals with the diagnoses but also throughout their social network, which in turn also ends up influencing these individuals, and so on. This leads to the suggestion that a looping effect with positive feedback consists of acceptance and reinforcement of the characteristics through which the diagnosis was made, which should then be treated so that the environment returns to normality. It is very common to think that various forms of distress, unwellness and psychological disorders can be caused, treated and cured solely through biological means (Legnani and Almeida, 2004). The practice of transforming social problems into pathological conditions takes away the responsibilities for deviations from the hands of the system, family, individual and society in general, thereby turning them into diseases that can be treated with a "magic bullet", to use Lewontin's term (Lewontin, Rose and Kamin, 2003). Agitated or inattentive behavior among children may become considered deviant. Schools that are overloaded with children are not in a position to deal with such situations and often transfer the responsibility for children who are considered to be problematic, to the healthcare system. In turn, the healthcare system is structured to diagnose and treat diseases and, for this reason, it generally provides a diagnosis and medication for individuals who seek care. The growth of cultural anxieties and demands regarding child development and wellbeing over recent years is the main factor, according to Timimi (200), responsible for the construction of ADHD as a biomedical disease. That is, in addition to the expectations regarding the functioning of the "machine", there are also expectations regarding its behavior. Perfect human beings would be those who obeyed the standards submissively. The highly subjective nature of the definition of ADHD enables a series of interpretations, thus turning this diagnosis into a repository for a variety of problems (Timimi, 2002), which are generally not resolved within the sphere of school. Because of this subjectivity, there is a risk of treating "normal" children as "ill", thus leading these children to incorporate this disease and consider themselves really to be ill. They may thus regard themselves, even after reaching adulthood, incapable of accomplishing day-to-day activities that are performed by other individuals who are considered to be "normal". Despite the looping effect with positive feedback that occurs in ADHD and the social control resulting from this condition, the diagnosis may present a beneficial side, consisting of "freeing" both the child and his own family from blame. The family thus ceases to be regarded as being to blame for the undesirable behavior. The child ceases to be labeled as badly brought up and becomes labeled as ill (Silva, 2009). His problem becomes located in the brain, in neurotransmitters, and is therefore relatively easier to "cure" or control. It seems to us that the social tolerance for people who are different is very low, to the point that people prefer to be called mentally ill, rather than slothful or disorganized. A process may be taking place in which the illness is tolerated because it can be treated and controlled, whereas it is believed that personality (taken to be the factor that generates behavior) is less palpable and more difficult to control. To treat individuals with psychiatric disorders today, internment and confinement are no longer used but, rather, medicalization. Bodies are tamed not through physical confinement in a lunatic asylum, but through psychological confinement using psychoactive drugs that model conduct, habits and thoughts (Caponi, 2009). This article derives from the master's degree project of Fabíola Stolf Brzozowski, under supervision from Prof. Dr. Sandra Caponi and with theoretical contributions from Jerzy André Brzozowski. ANDRADE, E. R.; SCHEUER, C. Análise da eficácia do metilfenidato usando a versão abreviada do questionário de Conners em transtorno de déficit de atenção/hiperatividade. Arquivos de Neuropsiquiatria, v. 62, n. 1, p. 81-85, 2004. BARRETT, J. R. Hyperactive Ingredients? Environmental Health Perspectives, v. 115, n. 12, p. A578, 2007. BLECH, J. Los inventores de enfermedades: cómo nos convierten en pacientes: Colección Imago Mundi. Barcelona: Destino, 2005. v.65. 256 p.
BOYD, R. Metaphor and theory change: what "metaphor" is a metaphor for. In: ORTONY, A. (Org.). Metaphor and thought. Cambridge, MA: Cambridge University Press, 1986. p.356-408. CANGUILHEM, G. O normal e o patológico. 2. ed. Rio de Janeiro: Forense Universitária, 1982. 269 p.
CAPONI, S. Michel Foucault e a persistência do Poder Psiquiátrico. Ciência & Saúde Coletiva, v. 14, n. 1, p. 94-103, 2009. COLLARES, C. A. L.; MOYSÉS, M. A. A. Preconceitos no cotidiano escolar: ensino e medicalização. São Paulo: Cortez, 1996. 264 p.
CONRAD, P.; SCHNEIDER, J. W. Deviance and medicalization: from badness to sichness: with a new afterword by the authors. Philapelphia: Temple University Press, 1992. 327 p.
DSM-IV-TR. Manual Diagnóstico e Estatístico de Transtornos Mentais. 4 (rev). Porto Alegre: Artmed, 2002. GOFFMAN, E. Estigma: notas sobre a manipulação da identidade deteriorada. 4. Rio de Janeiro: Guanabara Koogan, 1988. 158 p.
HACKING, I. A tradition of natural kinds. Philosophical Studies, v. 51, n., p. 109-126, 1991. ______. The social construction of what? Cambridge, MA: Harvard University Press, 1999. ______. O autismo: o nome, o conhecimento, as instituições, os autistas - e suas interações. In: RUSSO, M.;CAPONI, S. (Org.). Estudos de filosofia e história das ciências biomédicas. São Paulo: Discurso Editorial, 2006. p.305-320. ______. Kinds of people: moving targets. Proceedings of the British Academy, v. 15, p. 285-318, 2007. KONOFAL, E.; LECENDREUX, M.; DERON, J.; MARCHAND, M.; CORTESE, S.; ZAÏM, M.; MOUREN, M. C.; ARNULF, I. Effects of iron supplementation on attention deficit hyperactivity disorder in children. Pediatric Neurology, v. 38, n. 1, p. 20-26, 2008. LEGNANI, V. N.; ALMEIDA, S. F. C. A construção da infância: entre os saberes científicos e as práticas sociais. Estilos da Clínica, v. IX, n. 16, p. 102-121, 2004. LEWONTIN, R. C.; ROSE, S.; KAMIN, L. J. No está en los genes: racismo, genética e ideología. Barcelona: Romanyà/Valls, 2003. MARTINS, A. Biopolítica: o poder médico e a autonomia do paciente em uma nova concepção de saúde. Interface - Comunicação, Saúde, Educação, v. 8, n. 14, p. 21-32, 2004. RAFALOVICH, A. The conceptual history of attention deficit hyperactivity disorder: idiocy, imbecility, encephalitis and the child deviant, 1877-1929. An Interdisciplinary Journal, v. 22, p. 93-115, 2001. ROHDE, L. A.; HALPERN, R. Transtorno de déficit de atenção/hiperatividade: atualização. Jornal de Pediatria, v. 80, n. 2 Supl, p. S61-S70, 2004. SILVA, A. B. B. Mentes Inquietas: TDAH: Desatenção, Hiperatividade e Impulsividade. Rio de Janeiro: Objetiva, 2009. 271 p.
STILL, G. F. Some Abnormal Psychical Conditions in Children: Excerpts From Three Lectures. Journal of Attention Disorders, v. 10, n. 2, p. 126-136, 2006 . TIMIMI, S. Pathological child psychiatry and the medicalization of childhood. New York: Brunner-Routledge, 2002. 190 p.
TSOU, J. Y. Hacking on the looping effects of psychiatric classifications: what is an interactive and indifferent kind? International Studies in the Philosophy of Science, v. 21, n. 3, p. 325-340, 2007. URIBE, C. A.; ROJA, R. V. Factores culturales en el transtorno por déficit de atención e hiperactividad: habla la mamá. Revista Colombiana de Psiquiatria, v. XXXVI, n. 2, p. 255-291, 2007. VASCONCELOS, M. M.; JUNIOR, J. W.; MALHEIROS, A. F. A.; LIMA, D. F. N.; SANTOS, I. S. O.; BARBOSA, J. B. Prevalência do transtorno de déficit de atenção/hiperatividade numa escola pública primária. Arquivos de Neuropsiquiatria, v. 61, n. 1, p. 67-73, 2003. ZAVASCHI, M. L. S.; ROHDE, L. A.; LORENZON, S. F.; NETTO, M. S. Transtornos do comportamento na infância. In: DUNCAN, B. B.; SCHMIDT, M. I.; GIUGLIANI, E. R. J. (Org.). Condutas de atenção primária baseadas em evidências: Artmed, 2004. p.943-954. 1 This study had funding from CNPq. 2 This point is controversial, but pertinent to the case of ADHD. This topic is covered in greater detail in section 5. 3 It is true that classifications for natural kinds also require institutions, but in the case of people, classifications have a more prominent role. 4 The term is borrowed from Hacking [The Social Construction of What?] (p.116), in an attempt to resolve the difficulty in finding an equivalent for the "hidden structure" put forward by Hilary Putnam. According to Putnam, the hidden structure is the "essence" that confers the properties of a kind and makes it possible to attach references to it. For example, the hidden structure of water is its chemical formula H2O. Thus, according to Putnam, whenever we speak of "water", we are referring to the kind that has the chemical formula H2O.